Respected Christian counselor H. Norman Wright draws from his extensive experience to help couples establish strong, loving marriages. Whether divorced or widowed, people who marry again face unique challenges. Through 101 questions, Norm helps readers know their own views and understand where they agree and disagree with their future mates on finances, roles, sexuality, children, responsibilities, and previous relationship issues. Offering plenty of room for written responses, this essential premarriage guide helps couples work through problem areas before they become issues. They will also discover areas of strength and agreement that will help them establish a solid foundation for success. Ideal for couples, study groups, ministers, and counselors. 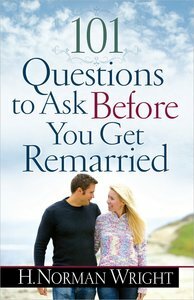 About "101 Questions to Ask Before You Get Remarried"